QuickBooks® allows our clients to focus on what they do best — running their businesses — and it allows us to support our tax clients in their day-to-day businesses. You get easy-to-use software that saves you time and money, and we get your business information in a format that allows us to easily provide adjustments. 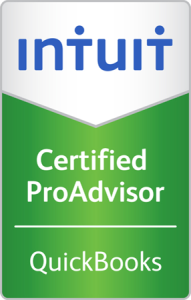 We are Certified QuickBooks® Pro Advisors and we help many of our clients by training them, assisting them on an on-going basis, and providing immediate answers for troubleshooting. Not only do we recommend QuickBooks® products for our clients but we also use QuickBooks® for our accounting, payroll and merchant services.